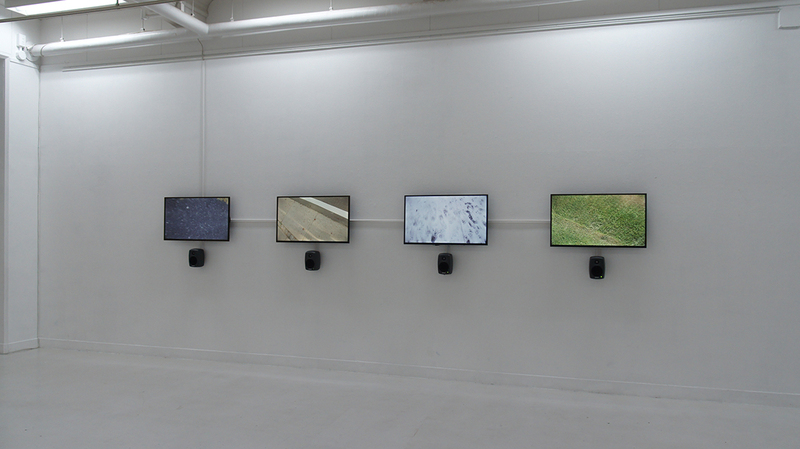 An installation consisting of four videos on 4 parallel monitors. Each video has its own audio track playing from a speaker below the monitor. The videos are made while walking. They are shot downwards, to the ground just in front of the walker. The camera is always pointed towards North, which means that each time the walker changes directions it is seen on the monitor as the earth streaming by in a different direction. All four videos show therefore simultaneously a movement of the ground, but each one in a different and randomly changing direction. The videos are temporally adjusted so all four walk in rhythm. The camera also moves up and down with the movements of the walker, and thereby creates a visual rhythm connected to the sounds of the footsteps from the speakers. All four videos are synchronised and form a common rhythm through the whole installation. The recordings are made in different kinds of urban and rural landscapes. The sounds of the footsteps on different types of material create a broad soundscape of mundane percussion.